In a few days, thousands of men and women from around the world will gather in Pamplona, Spain, to take part in the Fiesta de San Fermín—a nine-day, non-stop celebration in honor of a third-century saint. 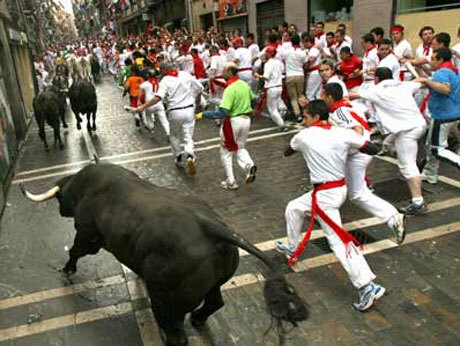 The “highlight” of the fiesta is the encierro—the running of the bulls. Each morning partygoers gather to run in front of six bulls and two steers as they make their way from the corral on one side of town to the bullring on the other. Foolhardy participants call it a thrill, a once-in-a-lifetime adventure they can go home and tell their friends about. For the bulls, it always ends in death. Twenty years ago this week I was one of those foolhardy participants. I was neither a vegan nor an animal advocate at the time. My 1992 self knew nothing about the world of animal cruelty. I ate from the table of ignorance and wore the skins of animals without a single thought about who they might have come from. But that summer, something in me shifted—a flickering of awareness, if you will—and it began in Pamplona. It was a cool July morning when I stood among a throng of revelers packed into Ayuntamiento Square in front of Pamplona’s town hall. The Spaniards around me loudly prayed: “A San Fermín pedimos, por ser nuestro patrón, nos guíe en el encierro dándonos su bendición.” (“We ask San Fermín, as our patron, to guide us through the bull run and give us his blessing.”) The little prayer imbued the event with a feeling of spiritual significance. The course, unchanged since the new bullring was built in 1852, is a mile of narrow cobblestone streets, freshly hosed down to remove the previous evening’s detritus, and barricaded with heavy timbers to keep the charging bulls in place. Many of the runners wore the traditional white shirt and pants with a red sash and carried a rolled-up newspaper. At 8:00 a skyrocket boomed, and workers in the corral prodded the bulls through the open gate. People around me surged forward, pushing and stumbling. Everyone was watching for the bulls, craning their necks as they moved forward. Rounding a street corner, one bull slipped and fell on the slick cobblestone and was gored in the back by the bull behind him. The crowd watching the run thought this sickening sight was wonderful, and they cheered. Runners with newspapers whacked the other bulls as they ran past. I turned right onto Estafeta Street, the event’s main drag of a quarter mile. Looking over my shoulder I saw four bulls, each weighing in excess of a thousand pounds, charge through the crowd, their brown heads and sharp horns rising and falling. The bulls thundered by, their imposing bulk surprisingly graceful. Never had I been so close to an animal so large, and I was surprised to see fear in their eyes. Out of the narrow street, the bullring was a hundred yards ahead, but once the last bull was inside, the doors were swung closed. I made my way inside through the main entry off the plaza and joined an arena filled with spectators watching scores of bull-runners now taunting the bulls. They smacked them with their newspaper clubs in an effort to corral them into a holding pen beneath the stands. These same bulls would die in the afternoon bullfights. The audience cheered as young men poked and teased these regal animals, mocking them in their fate. As I sat in the arena stands, I felt a deep wave of regret. Whatever excitement I had felt at participating in the encierro was suddenly eclipsed by contrition; in experiencing the fiesta, I had become a party to this spectacle. For the first time in my life, I saw these animals not as a commodity to be exploited, but as noble individuals wanting to live as much as I do. And so I cheered when one of the bulls caught a young man from behind with his horns and, in one adroit movement of his massive neck, threw the man up and over his back. The man sailed over the bull and landed in the dirt like a discarded marionette. 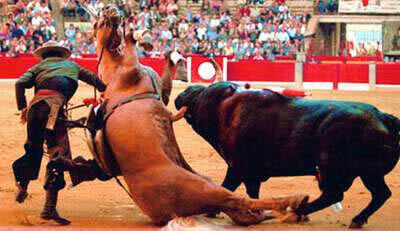 It is not uncommon for horses to be seriously injured or killed in bullfights. Bullfighting is morally indistinguishable from dogfighting or cockfighting; perhaps the only difference is that in bullfights, humans play a more hands-on role in the torment of vulnerable animals. In the bullring, men on blindfolded horses chase the confused bull in circles and repeatedly stab the large lump of muscle on his back with lances. (It is not uncommon for the bull to gore a horse, who is then dragged off.) Next come the banderilleros—men who thrust sharp, brightly colored sticks into the bull’s neck. Dizzy and weak from blood loss, the bull then faces the “brave” bullfighter for his final moments of agony. The bullfighter is actually called the matador, which is, appropriately, Spanish for “killer.” The matador’s goal is to plunge a sword between the animal’s shoulder blades. The animals almost never die instantly, and even with the tremendous blood loss, they remain conscious as the matador cuts his ear off as a trophy. Fully cognizant and in indescribable pain, the bull is dragged from the bullring by ropes tied around his back legs. Not wanting to witness a bullfight, I left the Plaza del Toro and made my way back to Estafeta Street and found several tourists dressed in white shirts and pants with red sashes. They were pondering the sight of bull’s blood on the cobblestone. “That’s where he got it!” said a drunken man of about 25, pointing at a smear of crimson near the curb. 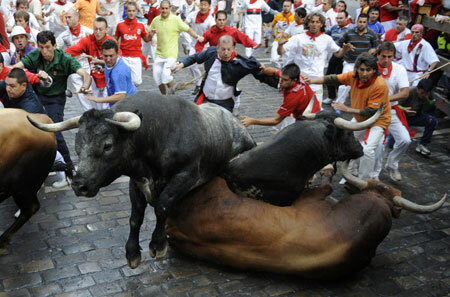 Was I the only person to travel to Spain, run with the bulls and then feel shame? It didn’t happen overnight, but soon after visiting Pamplona I began regarding all animals with an abiding respect. Gradually, I stopped eating cows, chickens, pigs and sheep, and I visited farms where these animals are cared for and allowed to live their natural lives. Watching them interact with other animals, it occurred to me that compassion is my religion, celebrated in kindness toward all beings. No scripture, no rituals, not even a prayer to a patron saint—just a reverence for all life. Today, Pamplona’s Fiesta de San Fermín is greeted with protests. Around the world, opposition to bullfighting has been steadily growing. The Canary Islands (a nationality of Spain), for example, prohibited this bloody pastime in 1991, and last year, Spain’s Catalonia parliament banned bullfighting in the region. “We Catalans do not want bullfighting anymore,” said one observer. “Finally, it’s over.” This is Spain we’re talking about—a nation for whom bullfighting has been an entrenched tradition for centuries. But other governments are also taking heed of protests. Panama banned the spectacles this year, as did Colombia’s capital city of Bogotá. Mexico City is also considering a ban. In Portugal, the municipality of Viana do Castelo demolished the city’s only bullring and built a science and education center on the site. “The defense of animal rights is not compatible with spectacles that torture and impose unjustifiable suffering,” said the city’s mayor. The mayor’s sentiment reflects an increasing abhorrence to bullfighting worldwide, yet this blood “sport” is being exported to countries such as China and South Korea. For more information about bullfighting and what you can do about it, please visit www.stopbullfighting.org.uk and the International Movement Against Bullfights.